Make the milk chocolate ganache first, as it needs at least a few hours to cool and set. To make this, I used 3 bags of Hershey’s milk chocolate chips, and 1 1/2 cups of heavy cream. To make, simply place both the chocolate and heavy cream in a heat proof bowl, and heat it for 30 second increments (stirring between). Usually after about 2 minutes of heat, all the chocolate is melted. Once the mixture is fully incorporated, place plastic wrap over the top of the ganache, and let it sit at room temperature. Before adding the room temperature ganache to a cake, I give it a slow stir with a spatula. I also recommend making the chocolate simple syrup in advance. It needs time to cool before it can be used, and preparing it ahead of time makes the following day a bit easier. Place the sugar and water in a pot, and bring to a simmer. Once the sugar has dissolved, mix in the cocoa, and turn off the heat. Place in a sealed Tupperware container in the fridge overnight. Bake two 6-inch round cake layers and one 7-inch cake layer using Yo’s chocolate cake recipe and instructions. You will have leftover batter! I chose to make an extra 6 inch layer to another baking project. Allow layers to cool fully before leveling. Place pans into the freezer for 1 hour, to accelerate the cooling process, and lock in the moisture. After the cake layers are baked and fully cooled, level the cakes by cutting off the tops using a serrated knife. 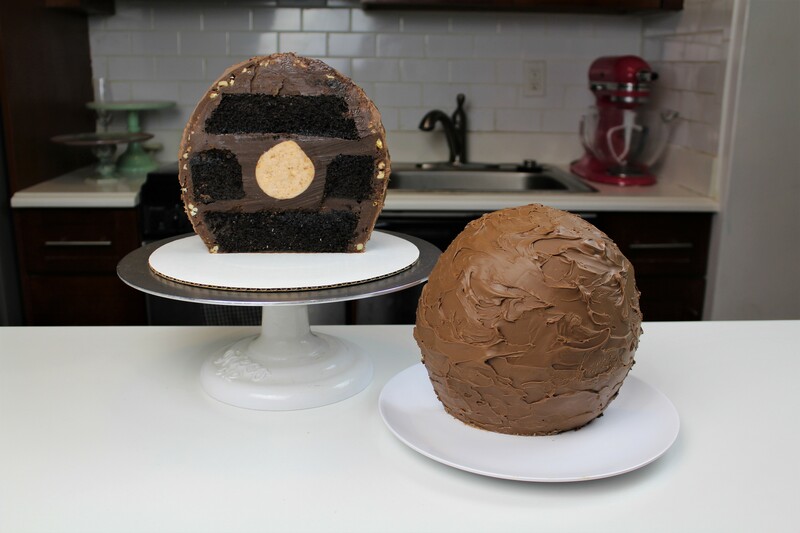 Trim the 6 inch layers so that they taper, to make it easier to frost in the shape of a sphere. Use a large, sterile paint brush to douse the cake layers with a generous coat of chocolate simple syrup. Next, it’s time to assemble the cake! Place the ganache into a piping bag. Stack on six in layer with the smallest side down. Cover the top of the cake layer with a thick spread of chocolate ganache. Use a 3 inch circle cutter to remove the center of the 7 inch cake layer. Place the 7 inch layer on top, and coat the cut outsides with ganache. 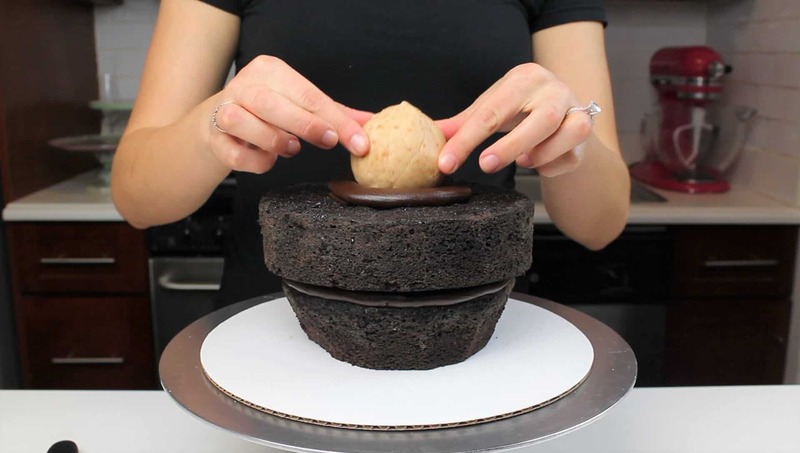 Carefully press the cake ball into the opening, then cover with another layer of ganache. Top with the final cake layer, then cover the entire outside of the cake with ganache. Smooth into the shape of a sphere, using an acetate sheet. Carefully press chopped hazelnuts around the outside of the cake, then chill the cake. Melt the additional chocolate, then pour over the cake, and add texture using a small offset spatula. For the chocolate cake recipe it says cocoa. Is that unsweetened cocoa or Swiss Miss hot chocolate style cocoa? What type/brand do you use? unsweetened baking cocoa! I use either hershey’s or black cocoa which I order on amazon! What do you do with the pudding? What is the purpose of the simple syrup? AH the pudding is a typo!! But the simple syrup is added to the layers, to keep them moist! The video from Food Network says that the ganache is DARK chocolate. Also, I am questioning the amount of ganache. 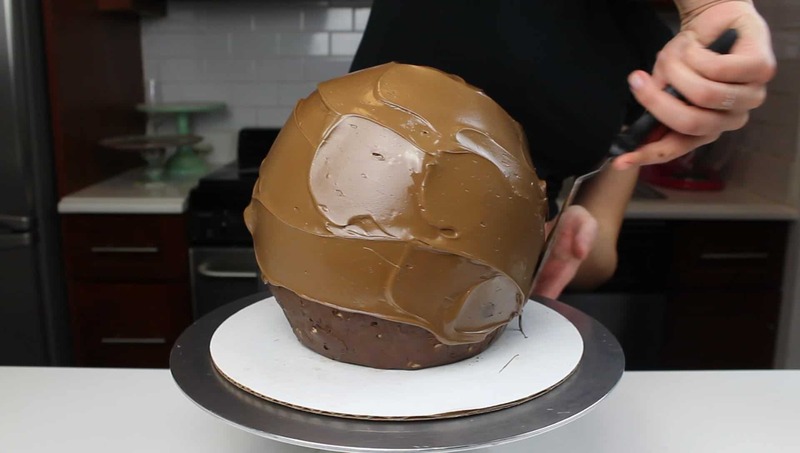 Are you telling me that 1 1/2 cups of ganache fills and covers this entire cake? 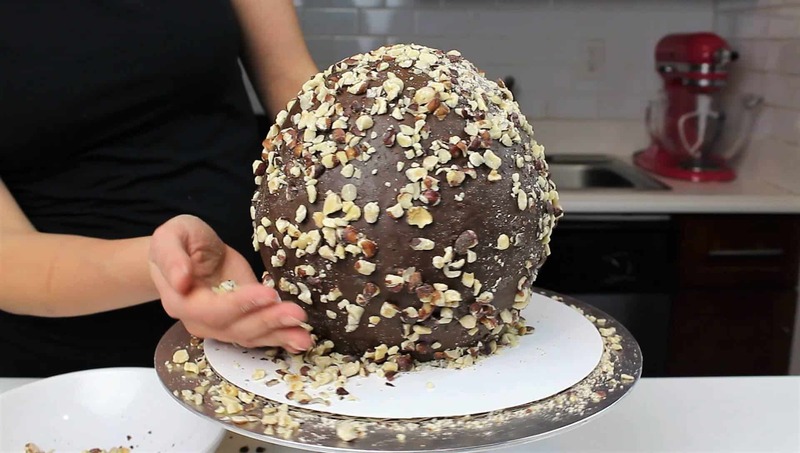 Your ganache bag keeps refilling itself in the video. I really want to make this cake, but I want to make sure I have enough ingredients to do it right. Thanks! This makes more than 1 1/2 cups of ganache, it says 1.5 batches!! I split the amount of ganache between piping bags. Part of it depends on how thick of a layer of ganache you add, but it should cover and fill the cake.The second layer is just melted chocolate, which is accounted for a different section in this recipe. Hope that helps! Beautiful cake. Very helpful. May I know how how many grams in one bag of chocolate please.